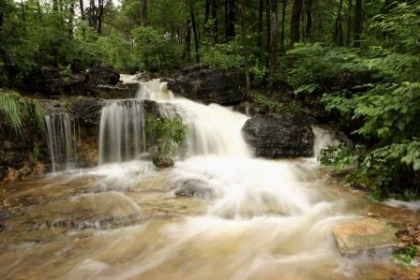 Experience the rugged majestic beauty of Missouri's Ozark Mountains when you buy Bluegreen Resort's The Cliffs At Long Creek. Buy a Bluegreen timeshare at this luxury resort nestled deep into the Ozarks which lazily rests alongside beautiful 43,000 acre Table Rock Lake. Outdoor recreational opportunities abound in and around this gorgeous mountain hideaway. You can enjoy leisurely stroll along the lake's magnificent shoreline, or take the opportunity to go hiking, mountain biking, or dipping in the cool fresh water. Boating and waterskiing are also favorite pastimes on the lake's pristine waters. Our owners have full access to amenities at our nearby Bluegreen Wilderness Club at Big Cedar which is home to its own restaurant and spa. A lovely indoor pool and relaxing hot tub are ready for our owners' use along with golfing and horseback riding at the Big Cedar Lodge. In Branson, just a few short miles from the resort you can find a wealth of fine dining restaurants, fabulous shopping, shows and a multitude of entertainment options. Buy Bluegreen Resort's The Cliffs At Long Creek and step into your own mountain vacation paradise. With five bedrooms including two master suites and sleeping up to 13, these vacation homes are the perfect spot for a reunion or extended family vacation. Buy a Bluegreen timeshare here and arrive with all of the amenities needed to make you feel perfectly at home. Take a deep breath of clean, cool mountain air as you relax on your private screened-in patio with chairs included. The main floor's master suite is furnished with a canopy king-sized bed, a full walk in closet and whirlpool tub. An entertainment area boasting a 42-inch LCD TV, dining room, laundry room and gourmet kitchen with breakfast nook is also on the main level. The lower level features another master suite with a king-sized bed, walk in closet and whirlpool tub. The family room contains a queen-sized sleeper sofa and a 42-inch LCD TV. The lower level also has a screened patio with dining set, pool table, and a fabulous media room home to an HD DLP projector, 92-inch screen and theater grade speaker system. It also has an iPod docking station with a remote gaming port. Enjoy a drink at your bar with that is fully equipped with a sink, small refrigerator and cooking surface. BuyATimeshare.com has a large inventory of Bluegreen timeshare deals available "for sale by owner." When you decide to buy Bluegreen Resorts the Cliffs at Long Creek, our company is your first choice for Bluegreen timeshare deals. BuyATimeshare.com specializes in timeshare resale and our knowledgeable, friendly customer service representatives are available seven days a week to answer any question you may have. Our business frequently handles Bluegreen timeshare resales and is sure to find you the best deal. BuyATimeshare.com is the only place you need to go when you decide it’s time to sell your timeshare. We frequently sell Bluegreen timeshares which gives us the experience and know-how to quickly and painlessly assist you with your transaction. Our associates will promote your timeshare resale in a professional and attractive advertisement. With over 12 years of experience in the business, we can save you the headache and hassle of trying to sell your timeshare on your own. Because we are a leader in Bluegreen timeshare resales, you can be sure your property will be exposed to a large consumer base. Since 2000, BuyATimeshare.com has successfully united clients who wish to sell Bluegreen timeshares to many happy buyers. Contact Bluegreen Resort's The Cliffs At Long Creek Specialist Today!